It's that time of year. Overindulgent holidays lead to regret and promises of joining a gym in the new year. So many people make excuses for not being able to commit to getting fit, and one of the main excuses out there is the outrageous cost of a gym membership. But getting fit, shedding a few pounds, and sticking to a consistent workout routine do not require a gym. 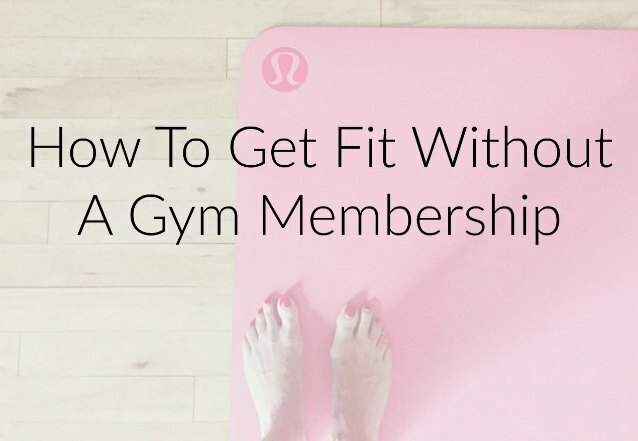 Getting fit without a gym membership is easier than you think! There are so many apps you can download that will make you feel like you have a personal trainer in your pocket. There are tabata apps, HIIT apps, and even yoga apps that can give you inspiration and tell you exactly what to do if you’re stuck. They’re a great way to get started if you struggle to motivate yourself. One of my favorite resources for fitness workouts is YouTube. There are yoga sequences, flexibility training, and weight workouts for arms and legs. It's so true that you can find everything you ever need on YouTube. One of the most inexpensive ways to get fit is to buy a few pieces of equipment to use at home. You don’t need a full gym set up to get a great workout in. You could invest in a few different resistance bands, kettlebells, a yoga mat, and even ankle weights. A garage or a basement are great places to set up small areas dedicated to fitness. If you have a sturdy space inside your home, try that instead. You don’t even need equipment to get a workout in, so you can’t use that as an excuse either. There are so many bodyweight exercises you can do, such as push ups, tricep dips, planks, and squats. You can create a full body circuit and fit in as many rounds as possible in 20-30 minutes with as little rest as possible. This will give you a fantastic workout in the shortest amount of time. Bodyweight exercises are great for perfecting your form before you add weights. However, you don’t need to add weights to make them harder. You could try doing push ups with an added hand clap, push ups up a wall, or even one armed push ups. There are so many variations of different exercises, that you have no excuse to get bored! Getting outside can be one of the best ways to get fit. It’s thought that simply exercising outside helps us to burn more calories and get more from our workouts. You could go running, walking, or even biking. Just make sure you’re careful, obey the rules of the road, and if you plan to cycle, get cycle insurance and any other equipment/supplies you need to stay safe. Simply aim to walk more in your everyday life. If you have a short distance to go, consider walking it rather than driving it. Park further away from your office building to get more steps in. Take the stairs, rather than the elevator. You could even consider investing in a pedometer to monitor how many steps you’re taking. This is one of the easiest and best ways to stay fit! I swear by my Fitbit. It's been a wonderful motivator as well as a fitness tracker.